Unfortunately, this shirt lost a battle with butter and/or oil in the kitchen (an apron is on my to-do list), but I wouldn't let it go in vain. From it I got two travel shoe bags. Here is how. 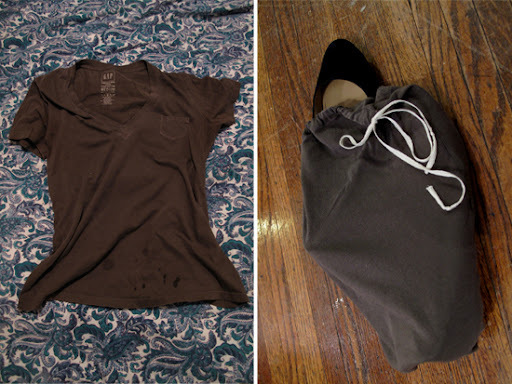 T-shirts, especially this very soft, stretchy, jersey one in particular, are great for shoe bags. 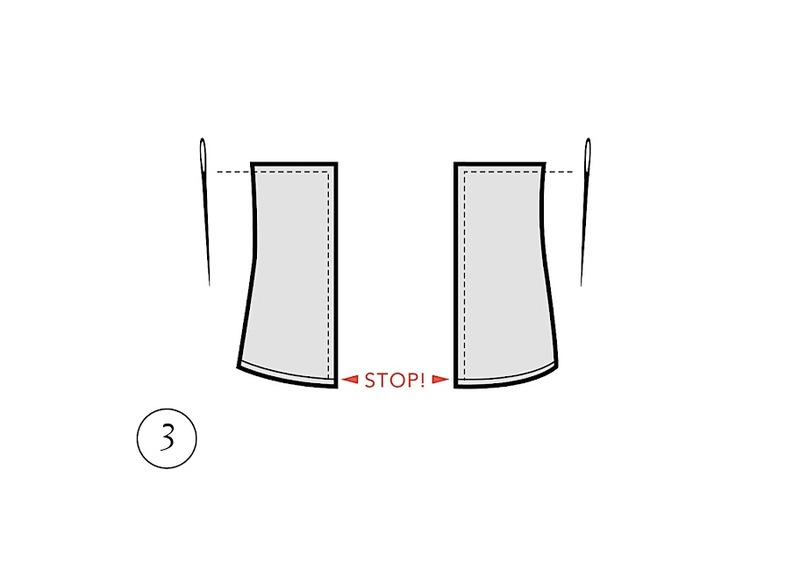 They'll protect your shoes from scuffs and you can use the hem already on the bottom of the shirt as the draw string tubing - meaning there is barely any work left for you to do. First, lay your shirt inside-out and flat, then make a cut across the chest. Fourteen inches from the bottom makes a good average size shoe bag, but if you've got shoes in mind that are a bit large you may way to make yours larger. Your call. Second, if you have enough width to get two bags from your shirt (approx. 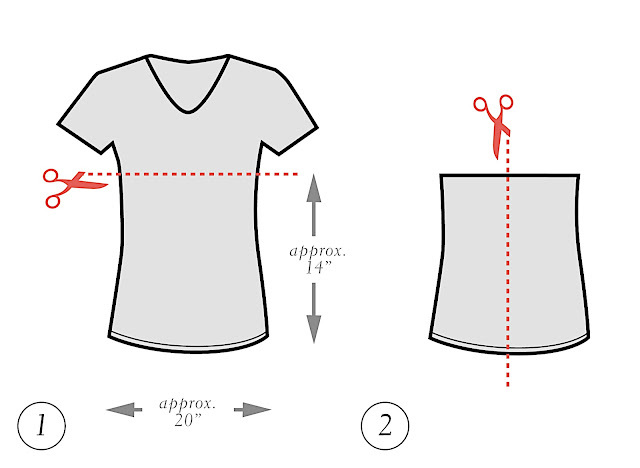 20") cut down the middle of your shirt as shown in fig. 2 above. If you can't squeeze two out of it, give yourself about 10" for one bag. Again, if you have bigger shoes in mind, make the bag bigger as needed. 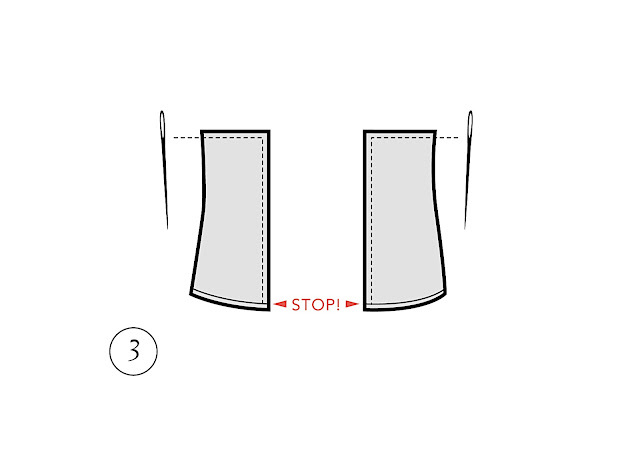 Thirdly, pin your open edges together and stitch along the open short side (the un-hemmed side) and down the long open side making sure to stop at the hem of the shirt. You need to leave this open so that your drawstring will work. Remember to always back stitch a few stitches when you begin and end a line of stitching. When you've finished your stitching, turn the bag right-side out. Using a length of cord, tie a knot at the end and attach a safety pin. Feed it through the t-shirt's hem (now your tubing) and out the other side. Insert shoes, pull drawstring. Success! A project like this is ideal to me. The value in re-purposing instead of trashing cannot be overstated. And the project itself is simple and will help you take care of other things you still own - hopefully prolonging their life as well. Sometimes when you think you've lost a shirt to an oil stain, there is still hope. I learned this having three peanut butter- eating children and loving to cook with butter (who wouldn't). Shampoo. Cheap shampoo. Like Suave. Nothin' fancy. Get your soiled area wet. rub on some shampoo into the affected area. rub in a bit. roll it up and let it rest for a day. toss in washer. Line dry and check for successful stain removal. Repeat if necessary or if attached to said article of clothing. Once you machine dry , the stain becomes more set, so "lather rinse repeat" is kinda a good mantra. Also, if you have a splatter stain, dilute your shampoo first and get generous about the swath of your application. I have found Dawn dish liquid works best on greasy food stains...just a note for those who want to try to get the grease out using this method as outlined above. I have used Dawn many times to get greasy food stains out of clothing for my mother (82 year old who has dexterity issues) and did many years ago as well for both my children. Letting it sit for several hours before washing is the key and I have even been able to lessen some old set in stains after they have already been washed and dried several times using the liquid Dawn trick. Fairy liquid is what you need. Put on before putting shirt in washer. Wow Great idea. I will try this.. I guess this post must have been rattling around in my brain this past week because I made some great projects with this info out of a pair of my boyfriend's old linen pants. Two shoe bags and two half aprons. Here's to knocking things off the to do list. Thanks so much for this simple and very useful post!